GX - G & W Machinery Sales, Inc. The Vytek Laser GX family consists of 3 main models: GX4848 the GX4896 , and the GX610, with special sizes for overseas markets available. The GX series of laser cutting systems, consists of the 4848, 4896 model and the 610 model. With oversize work areas of 48” x 48” (1250 mm x 1250 mm) 48"x 96" (1250 mm x 2500 mm)and 78" x 120",(2000 mm x 3000 mm) these models are the best equipped large format cutting and engraving system in North America. 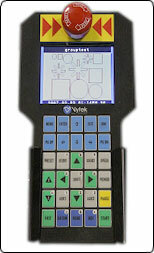 The StructureThe Vytek laser GX series is based on an XY gantry style positioning system. It utilizes dual brushless servo drives in the X axis (long axis) using high precision helical rack and pinion drives on each side. The Y axis uses a single brushless servo motor system driving a high precision drive to the head assembly. The entire drive system utilizes glass linear encoders to maintain the highest accuracy throughout the entire machine area. The GX platform is an all structural steel weldment that is made as one contiguous unit, stress relieved and precision machined. Table Assembly The Vytek frame and table assembly is unique in many ways. Flexibility and Throughput being at the top of the list for our customers, we designed a table system around the ability to rapidly change between thick and thin objects as well as heavy ones. The frame concept is designed around a pass through H design which includes a universal table assembly for supporting sheet stock and heavy objects. The table system was designed for blade, Honeycomb and pin material support. Fume extraction on the table is broken into 4 quadrants for down draft exhausting of fumes and includes front access clean out drawers for debris that falls through the table supports. The H design frame system also allows for a range of other fixture options including Conveyor, removable tray fixtures and special fixturing for specific applications and of course our exclusive multi table Sacker option. Stacker Material Loading System: The Vytek laser stacker option is a fully integrated material loading and storage system designed to remove the time associated with loading and unloading materials onto the laser bed. The system is designed as a vertical cartridge system to allow full table loads of material to be quickly moved in or out of the laser system. Systems equipped with the Stacker option can save up to 50% in job time while increasing the machine utilization. 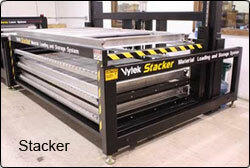 The Stacker also allows quick change over to one of three table surface types Pin, Slat or Honeycomb. With the flexibility to change rapidly to a different table surface combined with the time savings the Stacker offers significant throughout advantages for both short run as well as long run jobs. The Vytek laser cutting head assembly was designed for fast focus adjustment and stability during high acceleration and high velocity moves. Vytek offers 3 head choices, our standard motorized system with material thickness off set, our floating head option with reverse air flow floatation and our capacitance height following system for metal cutting applications. Our standard cutting head is a light weight assembly and utilizes a precision motorized screw for the Z axis motion. The head includes an integrated focus system and has a range of 3" (75 mm). This head can be used for both cutting and engraving and has the ability to accommodate optics from the standard included optic of 2.5" FL to 7.5"FL ( focal length) This head also includes an air, nitrogen and oxygen assist gas feature for choosing the correct gas for the application. The Vytek laser optional Floating Head assembly was designed for cutting applications including Steel, Plastics, Woods and more. The head focus is maintained through a contact floatation foot to maintain a constant focus to the material being cut. Vytek also offers a NON contact air floatation system when contacting the material will damage it or when the material is non-conductive and the capacitance option will not do the job. This option is essentially the reverse of an air hockey table the head dynamically adjusts the height as it goes. This system works regardless of material type and does not contact the material, so even sensitive materials can be cut with out damage. An additional option for this head type is our high velocity fume extraction feature. This option uses a vortex principle to extract fumes and smoke right at the cutting point. This system uses a very small amount of vacuum to achieve nearly perfect removal of the fumes. This feature is so effective that in many cases no other extraction method is needed for some cutting applications. The Vytek laser capacitance option is a non contact cutting head assembly which uses capacitance to maintain a preprogrammed distance from the work surface regardless of whether the material is flat over the work surface. 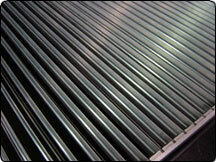 This option was designed specifically for metal cutting applications. The Control System The Vytek control system is a state of the art multi axis control with the ability to mange simultaneous motion for up to 8 axis. The interface to the control is through Ethernet and can be either run wired or wirelessly as the user requires. The control card was designed to allow for a direct connect of our Brushless servo drives allowing for data transfer to them in the MHz range for very fast servo update rates. The Vytek control can support a number of languages including the native language Ucito as well as G and M code for vector files and direct raster based files including Tiff, Jpeg, and BMP formats. For machine management, the system includes a rugged hand held pendant that not only allows for full machine management but also allows the user full mobility around the machine. For file management our control system is mated with our machine tools control software which manages file transfer, job history, diagnostics and more. This application runs in the background on the PC you choose to be the non-dedicated server for the laser system. Job files can either be sent from the system to the laser system and operated as a first in first out basis or the more preferred way of saving the job file to a user defined directory and then from the pendant requesting the job or uploading from that defined directory. This has several advantages. Operators are not programmers so files can be created well before they are ready to run on the system and can be rerun without having to re open the file on the PC. Run history is captured including cycle times. In theory multiple machines can be operated from one non-dedicated PC or multiple PCs can create jobs for one laser system. Machine diagnostics can be remotely checked with an internet connection. Our control system, software, motors and drive,s as well as almost all our electrical components are all made here in the USA which assures reliable support.